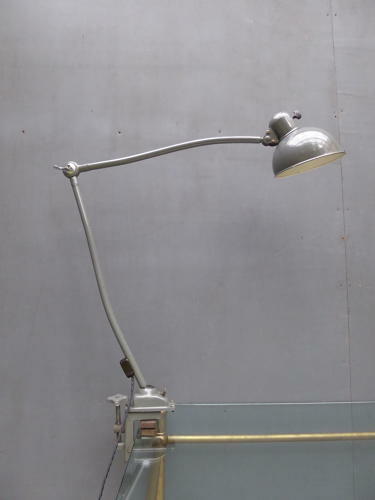 A large vintage Bauhaus lamp by Christian Dell for Kaiser Idell. A wonderful example of this scarce German classic with the familiar domed shade with integrated Bakelite switch, patented swivel ball joints & a iron clamp base. The lamp has an exceptional age related patina to the original factory finish & the trademark dome on the top of the shade is embossed with the Kaiser Idell branding. Given its precise positioning & extra long reach, this particular model, the '6726', has always been piopular with architects & draughtsmen. A handsome lamp, seldom found in this unusual dove grey colourway. From 1922 to 1925, Christian Dell worked in the metal workshop in the Bauhaus in Weimar where he was the main man behind a pioneering & innovative form of design. In 1926, he began designing lamps which when when manufactured, used an exquisite choice of materials & precision enginneering throughout. The Kaiser Idell range is still produced today & remain as popular now as they were then. The lamp accepts regular screw cap bulbs. Measurement of 125cm is a flat out measurement with the lamp at full stretch.